Is the Isle of Wight really "the best holiday spot in the UK"*, or are there better options for an English break such as Dorset, Devon, Cornwall, The Lake District, Yorkshire or Slough? We could settle it with a fight, but alternatively you could look at my analysis of how the Isle of Wight compares to other UK family holiday destinations in eight areas such as beaches, attractions, location and weather before you decide where to book. Of course, I think the Isle of Wight is the best place to visit in England, but I'm not so blinkered that I can't give you a fair comparison...honest guv. Beaches are the Isle of Wight's trump card in my view, because of its remarkably varied 65 mile coastline. They are my number one argument for calling the Isle of Wight the best place to visit in England for a beach holiday (yes, the Isle of Wight is part of England...). There are multiple currents and even climates, so you can plump for whatever you feel like when you wake up (unless you follow the system where each member of the family chooses a day's activities, so you end up wasting the sunniest day of the week in a ball pit). Perhaps you fancy a wide open sandy beach, like England's North East coast? The Isle of Wight's got Appley which is a massive playground for beach games. 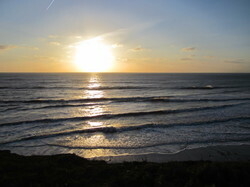 How about a Cornish-style surfing or bodyboarding beach? Try Compton Bay on the West coast. There's a brilliant rockpooling beach (Bembridge), a couple of mini-Blackpool style beaches with kiss-me-quick hats and chips on a bench (Sandown and Shanklin), secluded coves (Steephill Cove or Reeth Bay near Ventnor are nice), a busy shipping lane (Cowes) and so on. As a general rule, the Isle of Wight does things a bit smaller than other places. Dedicated surfers will tell you that the waves are usually not as big as they are in parts of Cornwall, and I expect the souvenirs are ever so slightly tackier in Blackpool. But if you want a varied holiday, rather than just one stretch of coast then consider the Isle of Wight. The Isle of Wight is also a good option if you want a cheap UK holiday, since the beaches are so varied that you won't get bored by day three and spend the rest of the week in the cinema. See our guide to the Isle of Wight's best beaches for more information. For its size, the Isle of Wight is very well equipped for summer attractions, with a good mix of adventure parks and zoos as well as historic things like castles, stately homes, museums, lighthouses and roman villas. There's certainly enough to see a good quality attraction every day for a couple of weeks, perhaps more, and there are also quirky things to do and free days out. The Isle of Wight's attractions are on the small and medium scale, rather than massive great theme parks with vomit-inducing rides. If you're expecting Alton Towers, London Zoo or the British Museum you'll be disappointed, but if you're expecting something a bit more modest and less corporate then you'll be impressed. If you're trying to entertain teenagers, I suggest you start looking at adventure activities and other similar ideas. Expect to pay about £5 - £15 to get into an attraction on the Isle of Wight, rather than £20 - £30 which you'll pay for bigger attractions in the rest of England nowadays. Another plus point for the Isle of Wight is that you won't spend the whole week in the car. From the centre of the Isle of Wight, you can't really drive for more than about 25 - 30 minutes without ending up in the sea, so you shouldn't have massive great journeys every morning (besides the occasional tractor you get stuck behind). We've had trips to Yorkshire and Cornwall where everything seemed to be an hour away. Similarly, the Lake District made the Isle of Wight's narrow roads feel like the Autobahn when we spent half a day trying to get from one side of a mountain to another. The roads are a bit wiggly, so you'll drive at 35 miles per hour for most of the week. There aren't many trains, but there are buses which are good value if you travel as a group. We prefer to use the car, but you can still get around if you don't have that luxury (see our guide to public transport). busy caravan parks near beaches which have lots of facilities such as indoor swimming pools for anyone who is too sane to swim in the sea. Nodes Point, Landguard and Lower Hyde are big ones, but there are others. posh holiday parks which call themselves 'Country Clubs' or 'Retreats' (West Bay Club, Woodside Coastal Retreat) where they will give you a facial and put cucumbers on your eyes (I assume). If you've got your own caravan, there's a similar number of camping and touring sites. Alternatively, there's a big choice of quirky places to stay, including glamping, houseboats, manor houses, treehouses, helicopters, railway stations and a castle. There are also lots of posh hotels for those looking to impress a loved one or looking to make up for apparently doing something wrong because of an innocent misunderstanding over whose responsibility it was to take out the bins (sorry, got a bit personal there). You'll see a lot of garlic, some crab on chips, various local ales, some local wine, loads of local seafood and Minghella's Ice Cream but there isn't a food or drink which all visitors feel they have to try whilst on holiday (unlike the Cornish Pasty or the Eccles Cake for example). However, there are a fantastic range of places to eat on the Isle of Wight, from the very cheap through to the posh nosh type places, which are usually overlooking the sea. ​The Isle of Wight is only a few miles from Southampton and Portsmouth and it’s certainly easier to get to than the Isle of Man, Guernsey or the Scilly Isles. From Birmingham you could be on the Island within 4 hours. It would take the same time to get to Truro in Cornwall, or 3 hours to get to the Lake District. From Central London, you could be on the Island with a car in about 2 hours 40 minutes, compared to 5 hours to the Lake District or Cornwall. From Manchester, the Isle of Wight is comparable to Truro (about 5 hours 30 including the ferry) whereas the Lakes are about 2 hours. 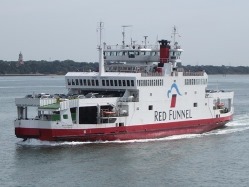 Bear in mind that during high season the ferry can add a fair bit to your holiday budget – anywhere from £50 up to £180 for a car full of people. However, there are lots of ways to keep the cost down, such as asking your accommodation provider to book for you (see our guide). If you’re travelling as a family it will probably only work out as £15 - £25 extra per person. Try not to blow your budget on the ferry's cafe. Personally I think the Isle of Wight punches above its weight for festivals nowadays – it used to be somewhat quieter when I was growing up. 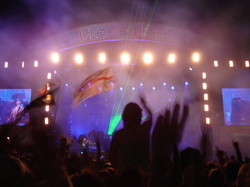 ​There are currently two BIG festivals each year on the Isle of Wight – Cowes Week and the Isle of Wight Festival. Besides that, there are several small and medium sized events like carnivals, food themed events and walking and cycling festivals (see our festivals guide). Festival season starts in the Spring and continues through until mid-Autumn. My usual advice to people planning a visit to the Isle of Wight is to avoid Cowes Week (early August) and Isle of Wight Festival (early to mid June) unless you plan to attend as they bump up prices and general busyness. The smaller events don’t affect prices as much and are a nice thing to incorporate into your visit. If you can name another UK coastal county with as many carnivals and festivals within a very short distance of each other then I'll send you a postcard with a written apology (we wrote a piece for the Huff Post on this topic). You see...the Isle of Wight is the best place to visit for a beach holiday in the UK. We've now been to most of England's touristy counties and my general conclusion is that the only place that beats the Isle of Wight for views and scenery is the Lake District. The Isle of Wight is hilly, but it doesn't have any mountains so the most spectacular bits (in my view) are the high cliffs around the west coast. The Military Road in the West Wight provides some of the finest scenery (click on image to move around). Check out my guide to some of my favourite views on the Isle of Wight. UK tourism bosses fall out over statistics about which has the best weather, because you can measure these things in different ways. One place claims the most hours of sunshine, another claims the most days with at least some sunshine. One claims the highest one-off temperature, another claims the highest average temperature and so it goes on. The Isle of Wight's average high for August (if that's not a contradiction) is 22 degrees celsius, compared to 18 in the Lakes and 19 in Cornwall. Of course I'm a bit biased - I love the Isle of Wight - but I don't own a B&B or a tourist attraction on the Island, so I can speak pretty frankly. The Isle of Wight is a fantastic choice for a UK beach holiday. The beaches offer a bit of everything on a modest scale, the weather is generally better than other parts of England (although several counties will tell you they are the best), the attractions are ideal as long as you aren't expecting Alton Towers, the scenery is beautiful and among the best in the UK, the food and drink is varied, getting around the Isle of Wight is pretty quick, getting there isn't as awkward as you might think, and there are loads of festivals to either avoid or plan your visit around. So what next? Are you convinced that the Isle of Wight is the best place for holidays in the UK? If so, read our guide to which Isle of Wight town should I stay, and then our guide to discount Isle of Wight ferry travel. Or take a look at holiday parks, if that's your thing.